ELGPN TOOLS NO. 2: GLOSSARY has been developed to provide a common set of definitions for lifelong guidance (LLG) policy development and related guidance terminology. 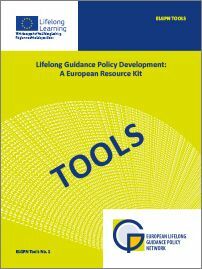 It provides a set of definitions that have been agreed by members of the ELGPN to support the use of ELGPN Lifelong Guidance Policy Development: a European Resource Kit. The aim of the Resource Kit is to support policy review and peer learning processes both within and between countries. However, in the absence of another source that defines commonly used terminology in this field, it is hoped that the ELGPN Glossary will also prove to be a valuable resource for practitioners working in this field across the EU. A critical issue for the Glossary is to define a set of terms, many of which are used in the Resource Kit, in a lifelong guidance context and thus facilitate dialogue on LLG policy development across the EU. As far as possible the glossary uses existing EU definitions, but these have been supplemented and extended where necessary to provide definitions that are relevant in a contemporary guidance context. However, certain terms, which have been defined in EU resolutions and directives, have not been changed.